Replacing power units can be costly. The good news is you do not need to replace the entire unit for your Parallax 7100 series, 55 amp power center. 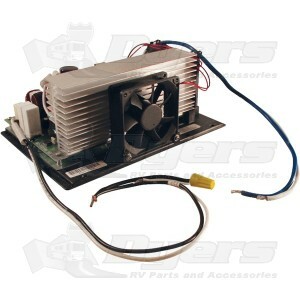 This is a lower unit replacement for the 7100 series 55 amp converter from Parallax. Simply buy the lower unit 081-7155-000 for your parallax converter and get your power up and running again saving you time and money! This replacement 7100, 55 amp from Parallax Power Supply is maintenance free giving you 30 amp AC service with 55 amp DC output. This Parallax replacement power center is one rugged RV power center. This is one of the most advanced 120 Volt to 12 Volt power converter systems on the market. The 7100, 55 Amp power supply comes with 5 AC branch circuits and 11 DC fuse circuits. The Parallax 7100 series 55 amp replacement is FCC class B Certified which means that it reduces signal interference from TV’s radios and emergency channels. The DC power coming out of this converter is filtered, free from spikes and surges to ensure the smooth operation of your RV appliances, like lighting, televisions and other electrical devices. At Dyers we have all the RV parts you need from converters, to awnings, we get you on the road for a trouble free journey! 105-130 VAC 60 Hz (975 watt). Product is high quality, reasonably priced, and shipped in a very timely manner and received in a short time. I will definitely order from Dyers RV again for all my RV and camping needs. Ultra quick service, exact replacement. This converter was the exact one that I had. It was no problem doing the installation. The shipping was great, arrived ahead of time and the cost was the best around. Not more you can ask for eh??? The price was the best I could find. The delivery was very fast. Only time will tell how good the product is. I hope it last longer than the original one did. I HATE BUYING ANYTHING MADE IN CHINA!